Do you ever have those weeks where you just can’t get to the grocery store to save your life so you can eat like a normal human? I had that this week. But instead of giving up and ordering take-out last night, I whipped up the quickest stir-fry ever. Sean and I were out of town over the weekend visiting his sister and new nephew in Florida, and Sunday is normally our grocery shopping day. We didn’t get home until after 8 PM on Sunday evening and by then, the grocery store was out of the question. Hence, I’ve been making meals out of anything and everything left in my nearly bare fridge until this weekend when we can stock back up. A rotisserie chicken on Monday night with salad and sweet potato fries tided us over til Wednesday, I had a variety of catered or hodge podge lunches at work, but last night, I wasn’t willing to give in to takeout Chinese or Indian like we often do. I like to save that for a treat on the weekends when we’re feeling particularly lazy, so I started doing some digging to come up with a quick, hot meal I could make that included some microwaveable brown rice I’d gotten from Trader Joe’s for just this purpose a couple of weeks ago. Immediately stir-fries came to mind and I wasn’t disappointed. There are approximately three trillion stir-fry recipes online (no exaggeration), but instead of one that was strictly Asian-inspired, I found a more refreshing, tart, lemon based stir-fry and with a little improvisation on the veggies, was rewarded with a really hearty, tasty meal. I’m not ashamed to admit I felt a very large sense of accomplishment, single-handedly pulling this meal together with no forethought until about three hours prior to dinner and a very, very quick stop at Publix. Plus, this lemony pork stir-fry came together from start to finish in under and hour. How’s that for quick? Not to mention, it’s low-fat as well. 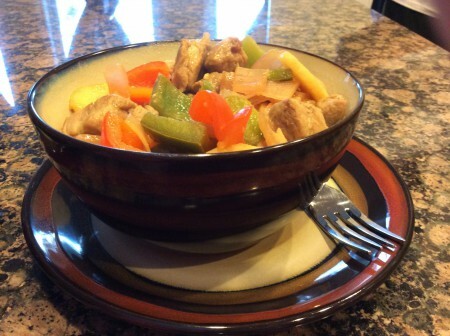 Whisk together all ingredients for stir-fry sauce in a bowl and set aside for later. 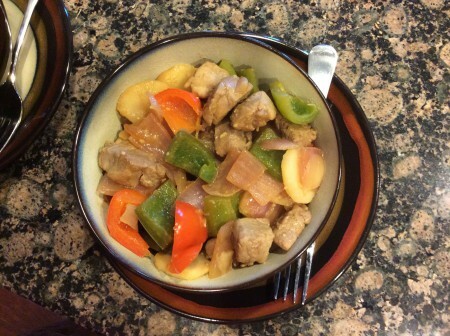 Cut up the pork tenderloin (or chicken) into bite-sized chunks, and set aside in a bowl with 1 tbsp. of soy sauce and 1 tbsp. of cooking sherry to marinade. Now, prep the onion, peppers, water chestnuts and whatever other veggies you may choose. Cut the onion into chunks and slice the peppers into roughly uniform pieces. Add 1 tbsp of canola oil to a large wok over medium-high heat. Once the oil is hot, add the pork and stir-fry, stirring frequently until all pieces are well-browned and cooked through. Remove the pork to a plate and add 1 more tbsp. of canola oil to the wok. Add the onion and cook until brown but still firm, 2 – 3 minutes. Then add the minced garlic and water chestnuts to the wok. Whatever veggie takes the longest to cook should be added first. Return the protein to the pan and add in the lemony stir-fry sauce making sure to coat everything well. Cook the microwave rice according to package directions (or noodles). Once rice is done, divide evenly between bowls, top with stir-fry and enjoy. Dinner’s ready. Ta-da! Dinner is ready in less than an hour. I served this with rice, but you can sub in noodles if you prefer. Hi Paige! I really think that I would love this recipe. The title only makes me hungry (Lemony Pork Stir-Fry). Thank you very much for the recipe. Me and my partner also has the same dilemma almost every week where we would be too lazy to cook or we don’t have any ingredients at all and we would give in to take out.